Men are seriously SO HARD TO BUY FOR, especially on Valentine's Day! But I have always thought they deserve gifts on Valentine's Day too because it is a day about love and men deserve to feel loved too, right?!!! Well, I got a great idea if you have a Running Man in Your Life: the Casio OmniSync STB1000 watch! It really is a unique watch and great for the runner or exercise enthusiast! 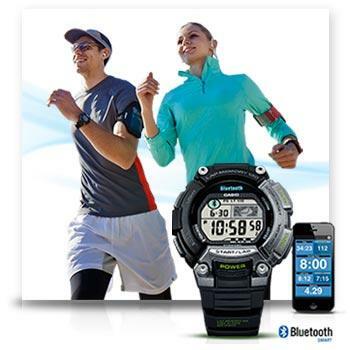 The Casio OmniSync STB1000 seamlessly connects with users’ smartphones via Bluetooth® v4.0 with low energy wireless technology to enable music player operation and the ability to check personal fitness data from popular mobile apps. In addition to its fitness capabilities, the STB1000 offers an incredible battery life up to two years and a versatile, 100 meter water resistant design, along with all of the necessary functions including world time, multiple alarms, countdown timer and 12/24 hour time formats. The STB1000 is an ideal sports watch for countless recreational runners who exercise with their iPhones. To make exercising more comfortable and enjoyable, the STB1000 allows wearers to operate their iPhone’s music player without having to physically access the device. Wearers can easily play or stop songs using the watch buttons, while also adjusting the volume or advancing a track. The STB1000 is compatible with many fitness apps: MapMyFitness, MapMyRun, MapMyRide, MapMyWalk, MapMyHike, Runtastic, Abvio’s Runmeter, Walkmeter, and Cyclemeter, as well as Wahoo Fitness, all of which are available for download from the Apple App Store. With these apps, the watch can be used to check personal fitness data such as pace, distance, elapsed time, split times, heart rate, speed, and cadence. You can purchase Casio STB1000 for $99.95 on Casio.com.